Welcome to the Lizards and Friends website! My name is Michele, and I’m a scientist who studies how lizards behave. I’m interested in how lizards “talk” to each other, and how their brains send signals to their muscles to cause the lizards to move. In my job, I work with a group of really fun students who are interested in lizard behavior too. We work together to catch lizards, to watch what they do, to measure the cells in their muscles and brains, and to tell other scientists about the new things we learn. We live in San Antonio, Texas, which is a great place to study lizards, because so many kinds of lizards live here. 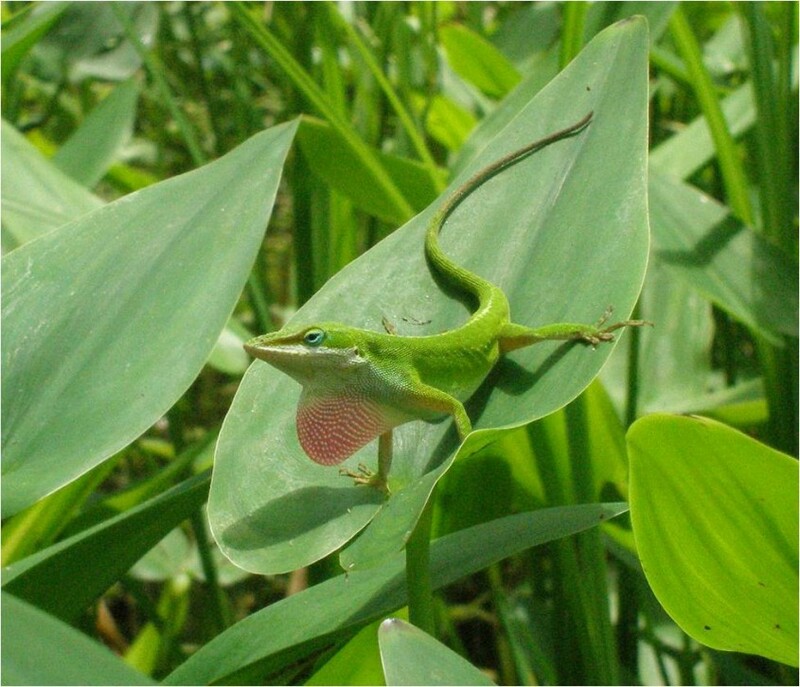 Most of our research focuses on lizards called green anoles. You may have seen these lizards in your own backyard. As their name suggests, they are usually green, but they can also turn brown, so some people call them “chameleons” (although this isn’t really the right name for them). Green anoles are especially fun to watch, because adult males have a bright pink throat fan called a dewlap that they use to send messages to other lizards, and sometimes to signal to us! We’re going to use this blog to tell you what we learn about lizards. If you’d like to be a part of our team, join Club LizKids to get email updates from the Lizard Lab, or visit this website again to see what’s new. If you have questions or ideas to share, Email Us– We’d love to hear your stories about lizards too! Hi Julian! Green anoles are among the best in my opinion, too! During the winter, these lizards don’t have many mating behaviors. Those behaviors usually occur during the spring and summer (what we refer to as the “breeding season”). Sometimes we’ll see the males displaying their dewlaps in the winter, but that’s rare. In the spring, as the days get longer and the temperatures get warmer, anoles (and other lizards in temperate regions) produce hormones in their bodies that help them prepare for mating again. In the fall, these hormones levels decrease, and the mating behaviors generally stop.